Christmas at Home, what do you want for Christmas? > BLOG > CHRISTMAS > Christmas at Home, what do you want for Christmas? There is a time between the 29th October and the 5th November when I start to think about Christmas and it usually begins with the Christmas Cake and that recipe will follow very shortly. However when putting together the post for the Christmas Cake my children asked me a question which went a little like this – ‘Mummy what other things are you doing for Christmas this year?” we talked about lots of things, we could make and truffles and edible decorations. 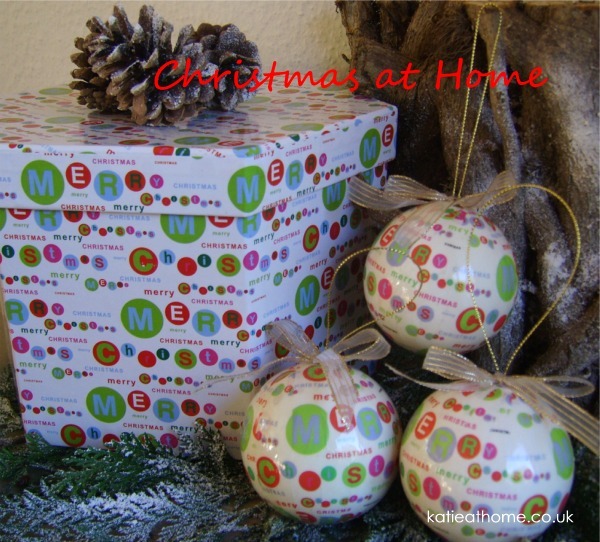 So . . What projects would you like from Katie at Home this Christmas? Obviously I have a few ideas . . but I would love to know what you would like. Perhaps . you want table decorations or presents to make and bake or tree decorations . . . or great ways to decorate the outside and inside of your home – just let me know and together we can have fun. So today I would like to say thank you to my children for making me stop and think, sadly they are back to school tomorrow! Looking forward to hearing from you – maybe you have a favourite recipe you would love to share?